Suarez’s goal – Liverpool counter, and the untracked Suarez gets on to a Jose Enrique through-ball, and slots into the near post. Johnson cuts in from right back as Liverpool look to launch a counter-attack. He plays a long ball out to Coutinho, with Walker chasing after him. He holds the ball up well, and is supported by Jose Enrique, who he finds with a back-heel down the line. Jose Enrique plays back to Coutinho again, as Suarez lingers around Livermore. Coutinho’s through-ball is excellent – right between Dembele and Livermore and into Jose Enrique. He mis-controls initially, but regains his balance to slip a pass in to Suarez, who has run in behind Livermore, with Jake caught ball-watching. Vertonghen also has time to see the run, but makes no move towards Suarez. In true Suarez style, he takes the shot very early and catches Lloris out at the near post with a toe-poked finish. 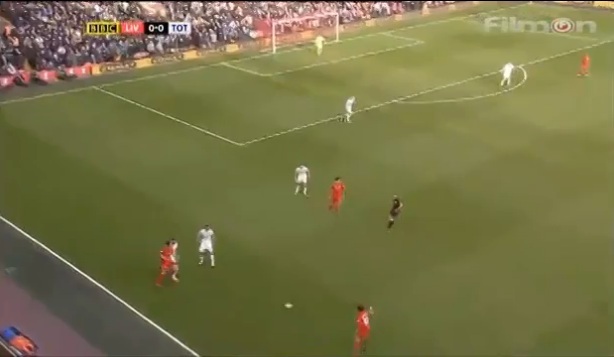 Downing’s goal – Walker launches a ball back towards Lloris without looking; Lloris rushes out to meet it, tries to take it past Downing, but the ball hits Downing and falls kindly for the winger to move forward and finish through Vertonghen’s legs. Spurs are 2-1 up, with 66 minutes played – at this point in the game we were coasting. Michael Dawson has possession, and plays a simple pass to Walker, who has limited options – his best bet being a cross-field to Vertonghen. In truth, he is not helped by Parker, who is stood centrally, not making himself available to receive the ball. Walker instead tries to play a first-time pass back to Lloris – clearly he has not seen Downing in an advanced position. As Lloris comes out to meet the ball, he is in a no-win position – if he tries to make a firm contact, the ball could ricochet off Downing and fly into the net. Instead, he tries to take it past him. Downing gets a slightly lucky bounce, and is able to take the ball on. Although Vertonghen has backed onto the line, Downing squeezes it through his legs to draw Liverpool level. A suicidal piece of play from Walker. Gerrard’s goal – Lloris punches Gerrard’s free kick to Defoe, who mis-kicks towards his own goal, putting Suarez in. His touch is heavy, but Assou-Ekotto collides with him to concede a penalty, which Gerrard scores. 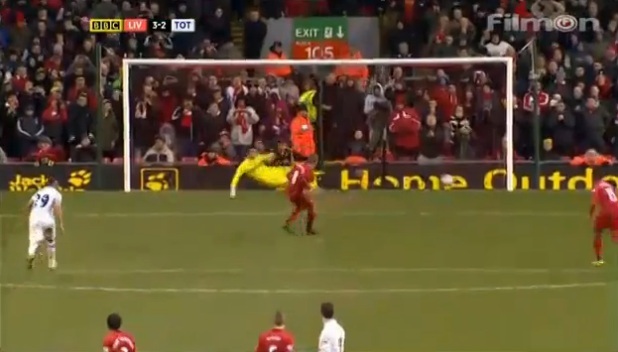 Gerrard whips in a free-kick, and Lloris does well to clear with a firm punch. The ball drops to Defoe, who takes a sloppy first touch, and then inexplicably sends a half-volley back towards his own goal – has he toe-ended the ball in trying an overhead kick? Why has he not just laid it back to one of the supporting players? As it is in the sky, Suarez recognises an opportunity. He gets to the dropping ball first, and is confronted by Assou-Ekotto, on his wrong side. The contact is little more than a shoulder-barge, but Suarez’s dramatic fall makes it look a nailed-on penalty. Gerrard sends Lloris the wrong way. what do you mean? of course it was defoes fault. not partly, compleately!!!! If you saw the Ekotto picture from the reverse angle you would see himput an elbow to Suarez's head for a foul. He does go across him, but the fall is ridiculous/unnecessary. Defoe's touch is shockingly inconsistent. I tend to agree, but it just irks that Suarez went down so dramatically. Defoe's touch was shockingly poor for the third goal, but if BAE stands up to Suarez this doesn't happen. I think the lack of another first team striker on the bench was a problem. Defoe looked tired in the second half and fresh legs would have helped this. Also, Livermore was very poor and I just don't see him being THFC quality. Good points - I agree with all you've said. Thought Coulthirst could have had 15 and would have done no worse than JD. Was a good move for the first but poor tracking from Dembele/Livermore, and a lack of reading from Vertonghen. Gerrard should have had two yellows IMO - the cynical trip on Sigurdsson, followed seconds later by the elbow on Bale. Without being overly critical towards Lloris, he didn't help the situation for their second goal. I know his game is all about anticipation, but I have noticed that he does sometimes rush out of his area a tad too quickly. He has been superb all season but I would wager that Downing won't be the only opposition forward this season to beat Lloris to the ball and be presented with an open goal. It might be nit picking, but he does need to curb his enthusiasm in this regard. I personally like his anticipation/fast racing out and think, in general, it will save more goals than it will cause. Adebayor's shooting is a strange one - he scored some long-range beauties for Arsenal and City, but never looks capable for us, even when he was in good form last season. I do think that a fully fit and confident Adebayor is a good striker, and good enough for getting us into the top 4. Less sure about Defoe, but if he can start scoring regularly he could be a stop-gap.